Share the healing arts of Oki-do Yoga and Zenthai Shiatsu. Experience the potential to heal, invigorate and enrich your daily life. Your investment is $450 and spaces are limited – a deposit of $100 will secure your place. 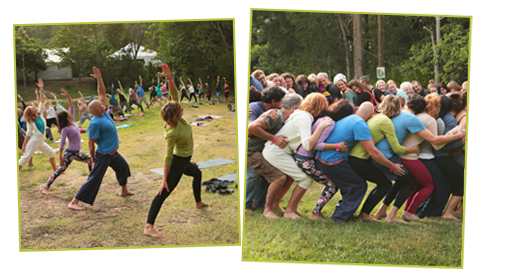 To organise a Group Yoga Workshop for your event, please get in touch with Lisa. These workshops are seasonal, based on Chinese 5 Element Theory. The workshops incorporate Oki-do practices, meridian stretching, yoga therapy and Zenthai Shiatsu massage. 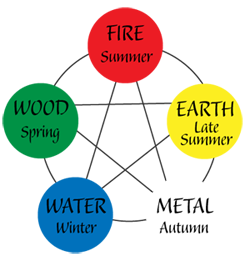 ~ EARTH ELEMENT - Late Summer - Stomach and Spleen Meridians. Nourishment and Digestion. Therapy for ankles, knees, hips and lower back. ~ METAL ELEMENT - Autumn - Lung and Large Intestine Meridians. Surrendering to Change. Elimination and Purification. Respiration. Therapy for shoulders and lower back. ~ WATER ELEMENT - Winter - Kidney and Bladder Meridians. Containing Your Power. Building and Maintaining Chi. Therapy for neck, backs, knees and hips, anxiety. ~ WOOD ELEMENT - Spring - Liver and Gall Bladder Meridians. Focussed Intention. Therapy for the joints. Mid back and neck. Hips, shoulders and knees. Stretching and releasing muscles, tendons and ligaments. ~ FIRE ELEMENT - Summer - Heart and Small Intestine Meridians. Embrace and express your joy. Circulation and assimilation of nutrients. Shoulder therapy. Time: 10am - 4pm - Each day will include an organic lunch. Be creative with food. Prepare simple and delicious meals promoting vitality and good health. All meals are gluten free and combine flavour, nutrition and colour to excite the senses and nourish the body and mind/heart. There should be joy in every meal. Starters: Vietnamese rice paper rolls with fresh Straddie Prawns. Chilli and tomato jam. Main:Free range chicken breast poached in red wine with garlic and fresh garden herbs, olives and cherry tomatoes. Salads- Green with avocado and carrot with currants and cashews. Dessert: Chocolate beetroot cake with organic cream and strawberries. All meals are gluten free. Tea and mineral water are provided. 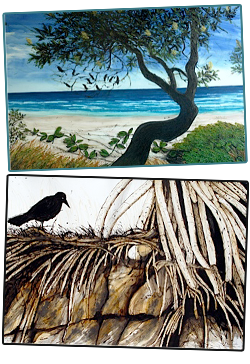 These 1 day workshops combine drawing and collage with mixed media on paper & developing artworks from still life, beachscapes and photographs. Organic, healthy lunch and morning tea will be provided.